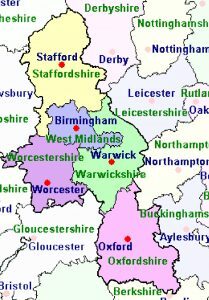 We work across the Catholic Archdiocese of Birmingham, an area that extends from Stoke in the North to the Thames in the South. This map shows an overview of where we work. A detailed map of the Archdiocese can be found on the diocesan website. We have created an interactive Map of Projects showing the locations of Caritas members. You can use this to search for activities near you. You can also visit our List of Members page for details of Caritas members. If your parish or group would like to get involved, visit the Membership page to find out more about joining. Alternatively if you would like to volunteer with us, please visit the Volunteering page to learn more.